I know we are still working on Valentine's Day, but since I have a few President's Day activities lying around the house I thought I would start to share them with you. The first two I got from my son's kindergarten teacher. The kindergarten is going to have a President's D ay parade. 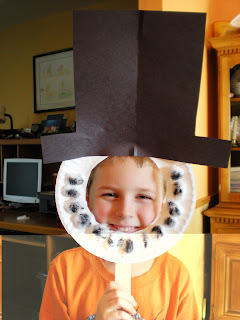 The children get to decide if they are going to be Abraham Lincoln or George Washington, so they made a craft for each. 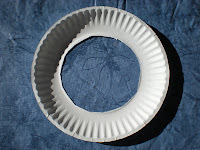 The first thing do to is cut out the center of the paper plate. This is a bit difficult so it probably should be done by a parent or teacher. 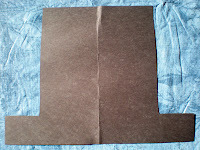 Next fold a piece of 9 x 12 black construction paper in half horizontally, draw half a top hat, or have a half one the children can trace, then cut out. 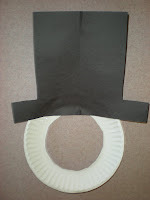 Use glue to attach the hat to the plate. Press really well. Next attach the holding handle to the plate. I used tacky as it is a bit stronger. You will also see I used a clothespin to hold the handle in place. 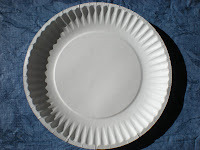 If your hat keeps falling over you can slide a tongue depressor down between the hat and plate and glue in place. 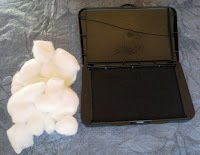 Finally, for Mr. Lincoln's beard you will need the cotton balls. 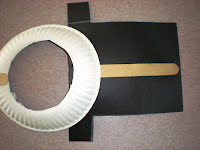 The teacher said that you can dip the cotton balls in black paint, but to try to cut down on mess, she had them press them into an ink pad, then glue them around the plate. I was with the class when we made this craft--be prepared for lots of black fingers. When the mask is all dry your little one is ready for the parade.